Editor's Note: This article is reprinted by permission from Auto Advisory Services, Inc. and Charapp and Weiss, LLC, co-authors of Auto Dealer Law and Auto Dealer Law, New Hampshire Edition. This article appeared in the Auto Dealer Law Quarterly Update, Volume 6, First Quarter 2016. To learn more about the NH edition, visit nhada.com/LegalGuide. As has been widely reported and experienced by dealers, automakers are becoming increasingly aggressive in launching recall campaigns. They are doing so to avoid the massive fines and public relations hits faced by automakers who have been publicly deemed less-than-proactive in recalling vehicles after discovering safety issues. While automakers can voluntarily recall vehicles whenever they see fit, the number of recall campaigns launched in the past several years is striking and unprecedented. Over the past five years, over 156 million vehicles have been recalled (to be fair, some vehicles are subject to multiple recalls and therefore counted more than once). When you consider that the entire US light duty vehicle fleet consists of approximately 253 million vehicles (according to IHS Automotive), that number is astounding. Combining these numbers with the survey results from NADA Used Car Guides (showing that 88 percent of consumers are more aware of recall-related issues now than in the past) and the efforts to broaden existing recall laws, it’s tough to deny that recalls are on everybody’s mind — and new car dealers have found themselves in the eye of the storm. Regardless of the reasons behind the onslaught of recalls, dealers should understand their obligations and exposure relating to recalls affecting their new and used vehicle inventory, and are advised to put in place company policies on how to detect and treat vehicles subject to recall. The National Traffic and Motor Vehicle Safety Act is the backbone of federal vehicle safety laws. The law authorizes the National Highway Traffic Safety Administration (NHTSA) to create and update Federal Motor Vehicle Safety Standards (FMVSS) that apply to new vehicles, and provides procedures under which manufacturers recall vehicles and notify vehicle owners and franchised dealers. 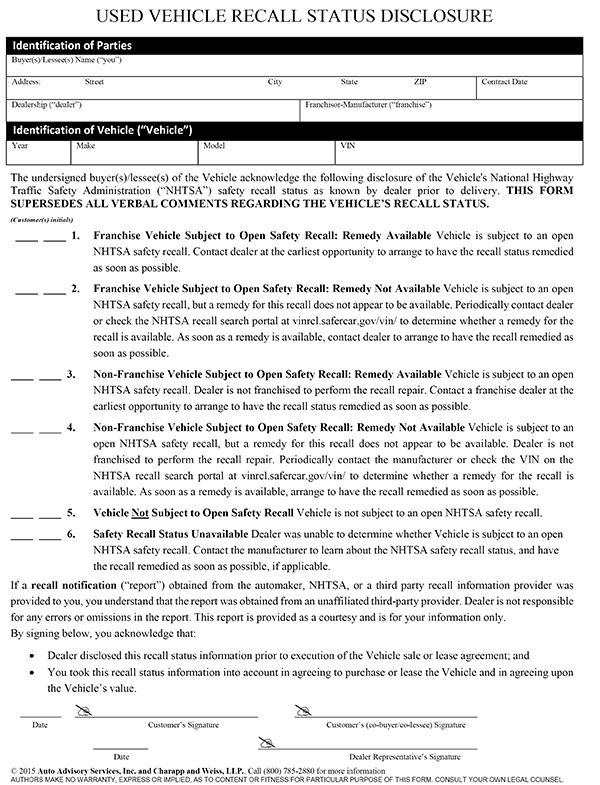 Under the law, NHTSA can either order a manufacturer to recall vehicles, or manufacturers can proactively do so themselves (most often, NHTSA investigates issues based upon consumer complaints and gently suggests manufacturers “voluntarily” recall the vehicle or face massive penalties and be painted as unconcerned with public safety). Cutting through that bit of antiquated legalese, most recalls relate to discovered problems with a vehicle or a vehicle’s equipment that create a safety risk. This can range from vehicles with faulty airbag mechanisms, to an exhaust pipe that extends slightly too far from the rear bumper and can cause risk of burns to people who may touch it when hot (see the recall notice below for an example of this). Once NHTSA and/or the automaker determine that a vehicle fails to comply with the FMVSS or contains a safety-related defect, NHTSA and/or the manufacturer may launch the recall. Once this decision is made, the wheels are put into motion: recall remedies are developed, franchised dealers are trained to perform the repairs, and registered owners of the vehicles are contacted using records in state DMV databases. As just about every franchised new car dealer has seen recently, these events do not always occur in the above-described order. Vehicle recalls trigger several different legal and policy implications for dealers, as described below. Under the federal Motor Vehicle Safety Act, new vehicles that are subject to a safety recall cannot be delivered until the defect is corrected. (While federal law contains no prohibition against advertising such vehicles, some state laws, such as those in California, prohibit advertising vehicles not actually for sale, and/or separately require that an advertisement must be withdrawn within 48 hours of withdrawing a vehicle from sale). Manufacturers may provide the dealership with the parts or equipment to fix the defect, plus reimbursement for the costs of installation, plus one percent of the manufacturer’s selling price of the vehicle per month (prorated from the date of the recall). Given the scope of recent recalls, the amount of compensation could be significant. Franchise documents or communications may set forth a process for applying for recall compensation. If not, dealers should inquire with their automakers about the procedures they have in place for filing recall compensation claims. A manufacturer that fails to comply with this law can be sued for damages, court costs, and attorneys’ fees, subject to a three-year statute of limitations. And while manufacturers have traditionally discouraged dealers from applying for compensation (taking a “c’mon, we’re all in this together” approach), recent efforts by the National Automobile Dealers Association are starting to yield positive results in this area — meaning dealers may want to make another attempt to seek the compensation to which they’re entitled. The federal Motor Vehicle Safety Act does not apply to used vehicles, nor (currently) does any state law equivalent. This means that dealers may sell and deliver used vehicles subject to recall without violating federal recall laws; it does not mean, however, that doing so is a good idea. First, selling a used vehicle subject to an open safety recall without disclosing that fact has been challenged by trial lawyer as constituting fraud by concealment of a material fact. Second, dealers who sell used vehicles that they are subject to a safety recall may face product liability actions if an accident occurs related to that recall — even if you do disclose the recall. Third, some state laws, such as those in California, generally prohibit the sale of a vehicle that fails to comply with state safety standards, as well as applicable Federal Motor Vehicle Safety Standards. Since non-adherence to Federal Motor Vehicle Safety Standards can trigger a recall, such recalls could indirectly implicate your used vehicle inventory. Unlike with new vehicles, automakers currently have no legal obligation under federal or California law to compensate dealers for carrying costs relating to used vehicles subject to recall — even if a “Stop Sale Order” applies that, pursuant to your agreement with the automaker, renders a vehicle unsalable. In addition to state and federal laws that may create legal obligations relating to recalled vehicles, your franchise agreement and other automaker contracts may create obligations on how you must handle recalls. This may range from a vague statement that you will assist the automaker in carrying out a recall or performing recall repairs, to very specific requirements. Be sure to consult your franchise agreement and other ancillary automaker contracts in deciding how you will deal with recalls. Be sure to pay close attention to limitations on the ability to sell vehicles as certified when subject to an open safety recall. As discussed in the “Game-Changing Recall Developments” article beginning on page 5, the FTC has focused on such sales in enforcement activity. Also be sure to pay special attention to recalls for which the automaker provides a “Stop Sale Order.” An agreement with your automaker may require you to treat such vehicles differently. Even if the franchise agreement does not specifically provide a contractual prohibition from selling such used vehicles, these recalls generally involve a higher degree of safety concern. Furthermore, the issuance of such instructions could be construed by a court (of law or public opinion) as increasing individual dealer responsibility if the defect for which the vehicle was recalled causes damage or injury. Dealers may also want to expand upon this policy to establish procedures to identify recalled vehicles prior to acquiring vehicles at auction or in trade — similar to the standard practice of checking the NMVTIS database, obtaining commercially available vehicle history reports, and running a KSR prior to acquisition. While this is yet another procedure to heap on to your used car department, doing so will give dealers insight into proper vehicle valuation, and can be helpful in deciding whether to acquire the vehicle in the first place. This will be particularly important if the dealership policy will be to avoid offering recalled used vehicles for sale. Since automakers are not obligated to pay compensation to dealers for used vehicle inventory subject to recall, and many recent recalls involve backlogged parts orders that may take months to resolve, a lot full of recalled vehicles can quickly become a burden on your flooring line. Dealers who decide to implement recall policies that involve checking vehicle recall histories and selling certain used vehicles subject to recall should properly disclose known recalls to consumers in writing (and obtain a customer’s signed acknowledgement of this disclosure in the deal jacket) in order to avoid potential accusations of misrepresentation. As discussed below, an employee with an internet-connected computer, iPad or smartphone handy prior to intake or retail sale may help successfully navigate this brave new world. Unless franchised to sell the specific line-make, dealers have traditionally had limited options for finding whether a vehicle is subject to a recall, or (even harder) whether an outstanding recall issue had been remedied for a particular vehicle. Some automakers had long placed VIN-searchable portals on their websites, but the timeliness of their updates was in question. Others had phone numbers to call, but the phones never seemed to be answered (at least when we tried calling). Non-franchised dealers could call the local franchised dealership, but would be uncertain as to whether they were given the correct answer. 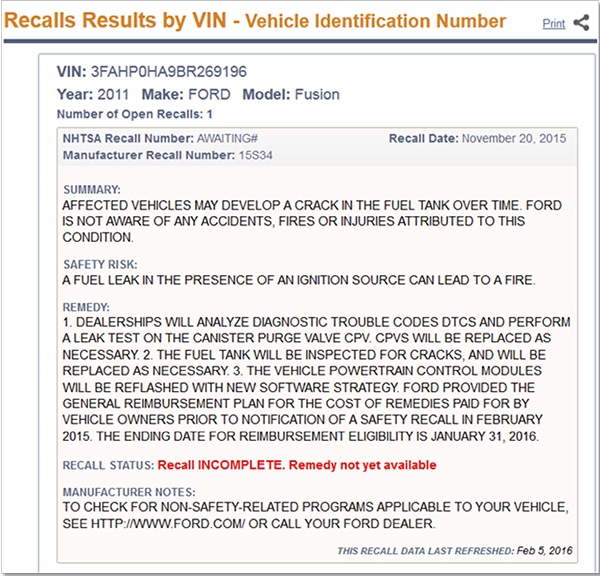 In an effort to resolve such difficulties, the 2012 federal highway bill included language requiring NHTSA to make recall information available to the public online, searchable by VIN, including information about unremedied recalls on that vehicle. NHTSA’s regulations, which took effect in 2014 required large automakers (with annual US sales of at least 25,000 vehicles) to make VIN-specific recall information on used vehicles available to non-brand dealers and the public via their websites, free of charge. The regulations require the manufacturer to update their databases at least weekly. 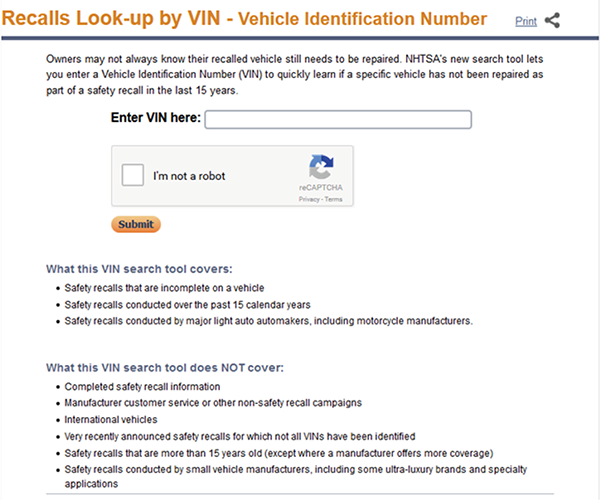 Concurrently, NHSTA launched its own publically-accessible, VIN-searchable portal on its website at https://vinrcl.safercar.gov/vin/. NHTSA’s portal allows consumers and dealers to enter any VIN, and the results will be retrieved from the appropriate automaker’s database. 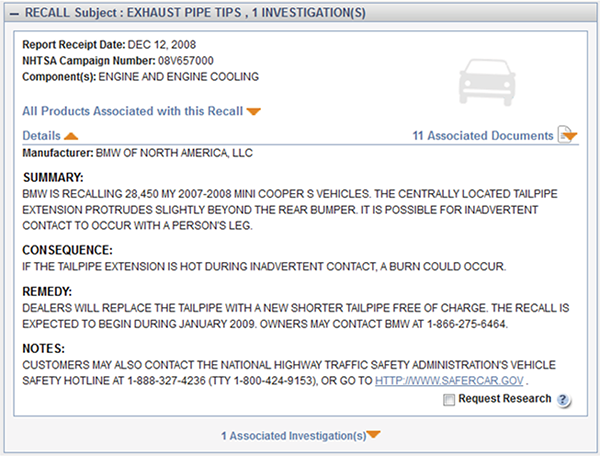 Since each covered manufacturer’s recall information is now accessible through NHTSA’s portal, this is the best source for recall information gathering. To gather such information, a dealer merely needs to enter the complete VIN for the vehicle in the appropriate field. The main portal screen is shown below. This is the best possible result — it means that the vehicle is not currently subject to an unresolved recall. If checking the database at intake, the dealer should check the VIN once again prior to sale in case a recall had been issued in the interim period. Recall Incomplete (Example 2): This result will appear if a vehicle is subject to a recall that has not yet been repaired, and for which a remedy is available through the manufacturer’s franchised dealers. The search result will provide a summary of the recall campaign, the safety risk, the recall status, and additional notes described by the manufacturer. When this result appears, the dealer must take into account that, in addition to standard reconditioning, additional work will be required through a franchised dealer to eliminate this status. While the recall repair will be performed without cost, it may take time to schedule — and that’s assuming parts shortages do not cause further delays. While the retail sale of a vehicle in this status is not unlawful in and of itself, dealers should take into account the extent and severity of the manufacturer’s safety risk description in deciding whether they want to acquire the vehicle or offer the vehicle for sale at retail. Recall Incomplete: Remedy Not Yet Available (Example 3): This result will appear if a vehicle has been recalled but the manufacturer has either not yet identified a remedy, or parts necessary for the remedy are not yet available to dealers. The search result will describe the recall campaign, the safety risk, the recall status, and additional notes described by the manufacturer. This search result provides the most uncertainty for a dealer — both as to the timing of an available remedy, as well as the extent of required repairs. In deciding whether to acquire such a vehicle, the dealer may want to check the general NHTSA search website at www-odi.nhtsa.dot.gov/owners/SearchSafetyIssues. There, the dealer can enter the year, make, and model of the vehicle and have access to the actual formal recall documents from the automaker and NHTSA. Some of those document can provide information on estimated time frames before a remedy should be available. Recall Information Not Available (Example 4): This result will appear if the automaker is not subject to NHTSA regulations (e.g., they sold fewer than 25,000 vehicles the previous year and elected not to participate in NHTSA’s database). The result will indicate that recall information is not available for the vehicle, and direct the viewer to contact the automaker directly. 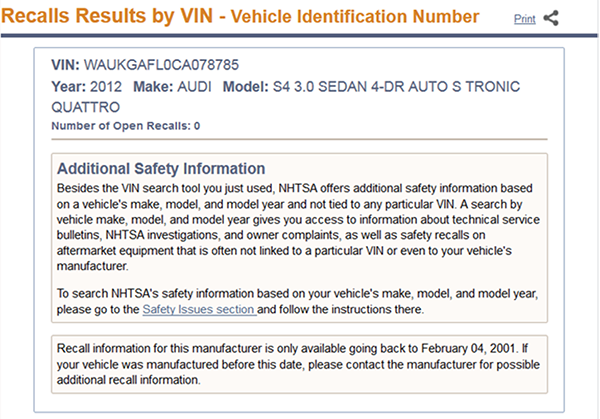 Regardless of what result appears after a VIN search, NHTSA’s portal includes a button allowing for the result to be printed. These results be printed and retained. One of the more common recall policies that has been adopted by dealers is to sell some recalled used vehicles designated by the service department to be low risk, but to disclose the recall to a consumer prior to sale. A dealer who adopts this approach seeks to protect itself from increasingly-common consumer claims that the dealer failed to disclose a material fact that it knew or should have known at the point of sale, and thereby defrauded the consumer by concealing this fact (that the vehicle has been recalled and not yet repaired). In light of such potential liability, as well as increased government enforcement activity relating to recalls, we recommend that dealers disclose the recall status of vehicles to customers. 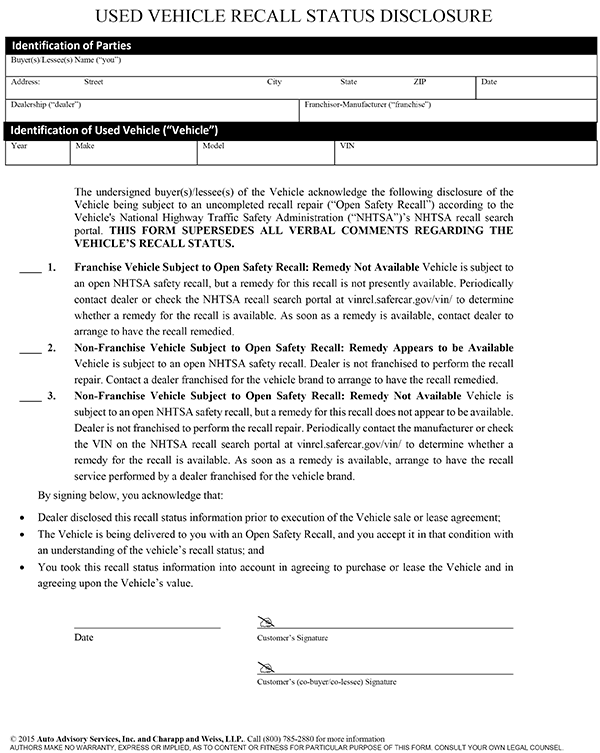 We have developed two sample forms that a dealer may use to do so — depending upon the policy chosen by the dealership. In any event, we strongly recommend that dealers consult with their own counsel to discuss the manner in which safety recalls are disclosed, and be sure that any form used is modified to reflect the individual dealership’s recall policies. 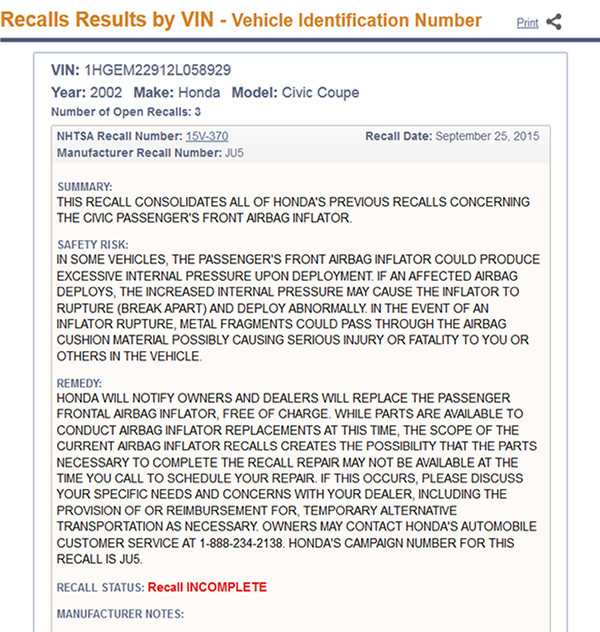 Vehicles where the recall status is unavailable. Non-franchise vehicles subject to recall with no available remedy. A dealer using this form would follow the same instructions as with Form 1, but only for customers purchasing a non-franchise vehicle subject to recall or a franchise vehicle subject to recall for which no remedy is available. This form would not be used in circumstances where an open recall does not apply or where the recall status is unavailable. Nor would it be used when a franchise vehicle is identified as being subject to recall where a remedy is available, since the dealership would not sell the vehicle in such circumstances. Note: Providing a disclosure is no guarantee that a dealer is shielded from liability from a third party lawsuit or potential product liability claims (which will look all-the-uglier if the defect leading to the recall caused an injury or accident), underscoring the importance of setting an internal policy identifying which recalled vehicles should not be sold. While dealer responsibilities relating to new vehicle inventory are clear, the legal requirements relating to used vehicles are far less certain. Given the high-profile status of recall concerns in today’s press, we recommend that dealers be proactive in developing policies (in consultation with counsel and the safety and service experts within the dealership) on how to treat used vehicles subject to recall. Such policies should necessarily involve whether to retail recalled used vehicles that the dealership is franchised to sell, may extend to determining whether non-franchised used vehicles should be retailed as well (and would necessarily involve creating a policy of identifying used vehicles subject to recall in your existing inventory prior to sale, as well as determining whether to acquire such vehicles). While no law currently requires dealers to do so, dealers are advised not to wait until such laws are passed.